Systemzone and Systemlex make it simple to configure heating zones with a variety of heating sources and heat emitters. The following examples illustrate what can be achieved using the unique features of Systemlink zoning products. For more technical information on a greater number of the more frequently encountered layouts, please refer to the Schematics Database. 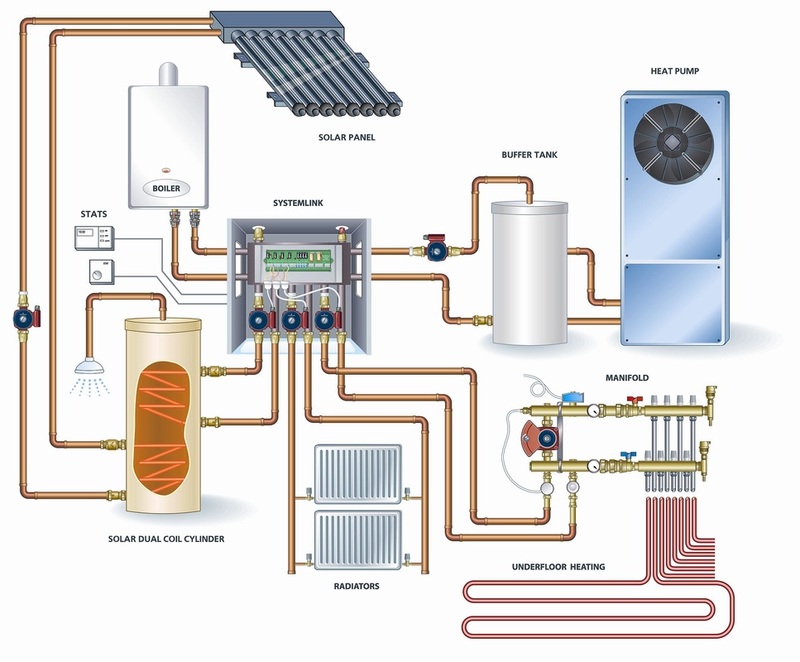 This diagram shows the Systemlink unit in a domestic setting. The Systemlink unit consists of a Systemzone and Systemlex in an enclosure with pumps, valves and automatic air vent. The two outside Systemzones are fed by the heat sources. As these operate independently of each other, any combination of boilers can be used to match the load to the optimum operating level of the boilers. Heat sources can be taken off line for maintenance or replacement without interrupting service. 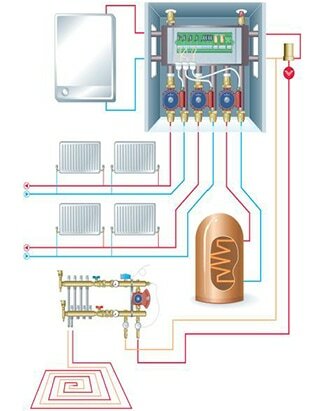 The central Systemzone takes the output from the heat sources and delivers it to the heating zones - four in this example. These can be further subdivided into additional zones by using more Systemzones. Using multiple boilers rather than one or two large ones can greatly reduce the initial capital cost. For instance, using balanced flue boilers can save the expense of a high chimney. The unique patented properties of Systemzone makes it easy to accommodate the different temperatures and flow rates of the various heat sources and heat emitters. This is because Systemzone allows each component circuit to operate independently of the others.